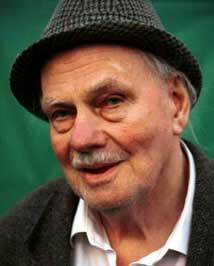 Poet and songwriter Hamish Henderson was born in Blairgowrie, Perthshire. During the Second World War he served in North Africa. 'Elegies for the Dead in Cyrenaica' (1948) chronicles that experience – the drama and horror of battle set against the tedium of military routine – and explores the moral implications of war. Hamish Henderson wrote many great folk songs, such as 'Ye Banks of Sicily' and 'Freedom Come All Ye'. A dedicated folklorist, his passion for his subject and extraordinary breadth of knowledge illuminated his lectures at Edinburgh University's School of Scottish Studies. For many years he travelled around Scotland collecting traditional songs and tales. When he met Jeannie Robertson in Aberdeen in 1953 she was a little-known singer; Hamish Henderson was instrumental in introducing her remarkable voice and rich store of traditional song to a far wider public. His later publications included 'Alias MacAlias: Writings on Song, Folk and Literature '(1992), 'The Armstrong Nose: Selected Letters '(1996) and 'Collected Poems and Songs '(2000).